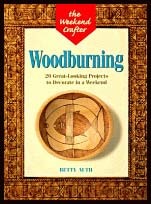 Since I have a heart for history, this book touched my interest immediately when the author began to relate her woodburning techniques to a box her grandmother had decorated over 100 years ago. Woodburning, previously called "Pokering" is the delicate art of using a hot piece of metal to etch a lightly burned line into a piece of wood. After the burn is complete, the piece can be painted or stained and varnished to suit the artist. The reason it was called "pokering" in the 1800's and earlier is that various irons were placed in the fire and when they were hot enough they were used to incise the design; however cooling off was an issue and many irons and long hours were required to complete a project. Today irons are electric and no more complicated to use than an electric curling iron. The author carefully explains each step and thoughtfully offers the most practical and economicial options for obtaining the necessary materials...not only for the actual woodburning, but for the painting and/or staining and varnishing. Her suggestions regarding stains and varnishes are pertinent to any area of woodworking. She presents the step by step details for completing 20 projects from bowls to birdhouses to jewelry to planters and urns; and includes several pages of patterns that can be enlarged or reduced to suit the reader's choice of design. The patterns are original and extremely attractive. Since my own personal curiousity could not be contained, I made a letter opener and decorated the handle according to the instructions, adapting one of the patterns in the book. The project, two primitive style deer running through the forest, took a long time and involved some cheek biting to complete, but the results were interesting and showed a lot of promise for future endeavors. And now I have a letter opener, which I badly needed. Thanks to Betty Auth. Anyone interested in purchasing this book should try here.